← The Evolution Of Bread . . . The Politics of Bread . . . In Egypt, around 1000 BC, inquiring minds isolated yeast and were able to introduce the culture directly to their breads. A new strain of wheat was also developed that allowed for refined white bread. It is widely believed that around thirty types of bread may have been popular in ancient Egypt. This was the beginning of truly modern bread, the beginning of a worldwide industry. Bread and wheat were especially important in Rome where it was thought more vital than meat. There were public bakeries where the poorer people brought their bread to be baked, or from which they could buy ready-baked bread. Common Soldiers felt slighted if they were not given their proper allocation. The Roman welfare state was based on the distribution of grain to people living in Rome. Later the government even baked the bread. The ruins of Pompeii and other buried cities have revealed the kind of bakeries that existed. In the ruins of one such bakery, the oven and the mills to grind the flour were found, as well as actual loaves of bread that had been carbonised intact. A Bakers’ Guild was formed in Rome round about the year 168 BC. From then on the industry began as a separate profession. 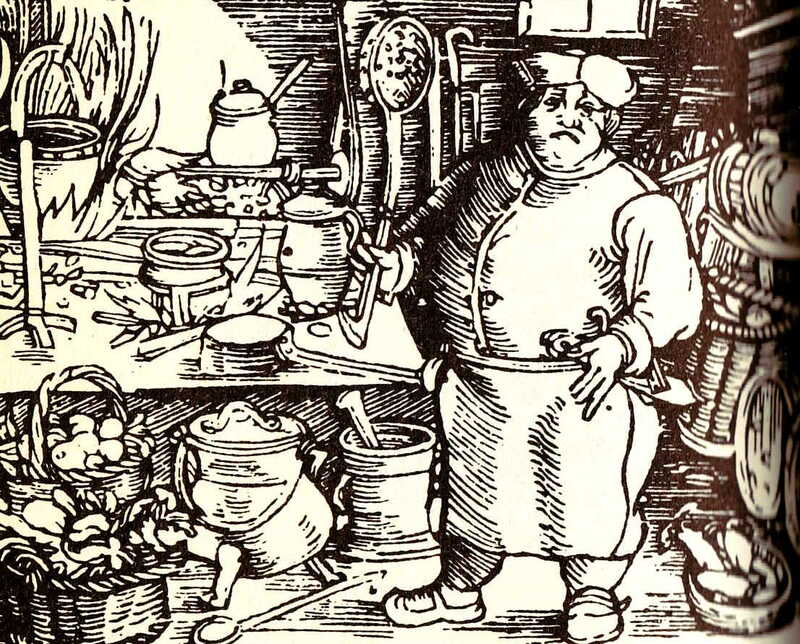 The Guild or College, called Collegium Pistorum, did not allow the bakers or their children to withdraw from it and take up other trades. 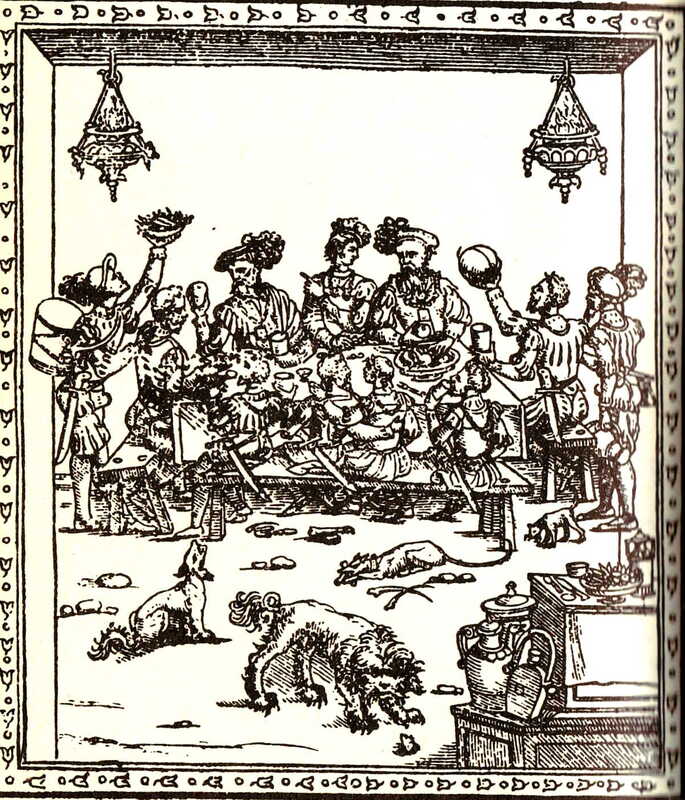 The bakers in Rome at this period enjoyed special privileges: they were the only craftsmen who were freemen of the city, all other trades being conducted by slaves. The members of the Guild were forbidden to mix with ‘comedians and gladiators’ and from attending performances at the amphitheatre, so that they might not be contaminated by the vices of the ordinary people. The ruling classes, knowing that rebellion often followed famine, did their utmost to keep the price of bread from rising too high. Laws regulating its price were passed during the reign of King John (1202). Not only did the law fix the price, but also it strictly allocated that price between cost of material and an allowance for necessary charges to the baker. For instance, a master carpenter would be paid only 2d. per day, ordinary woodworkers were receiving only 1½d. 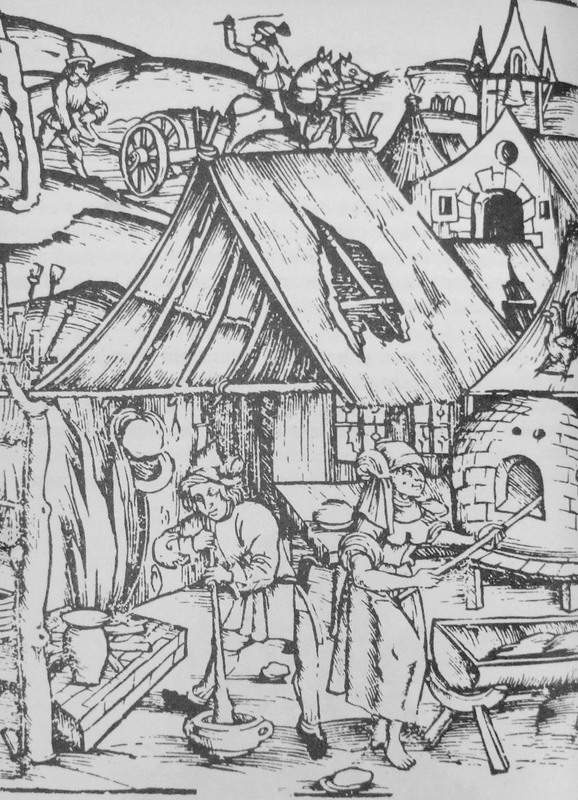 Bakers earned less than this, but they were not dependent on the weather and could always be at work, unlike the carpenters. All through English history, great efforts were made to keep the price of bread low, to maintain good quality, and to prevent corruption and dishonesty. Through much of history, a person’s social station could be discerned by the colour of bread they consumed. The darker the bread, the lower the social station. This was because whiter flours were more expensive and harder for millers to adulterate with other products. Today, we have seen a reversal of this trend when darker breads are more expensive and highly prized for their taste as well as their nutritional value. During the middle ages bread was commonly baked in the ovens of the lord of the manor for a price. It is one of the few foods that has sustained the poor through many a dark age. In English history, there are constantly recurring periods of famine, due to not enough, or too much rain, or frosts, and other natural causes. Bread continued to be important as bread riots during the French Revolution attested. The famous quotation attributed to Marie Antoinette that if the poor could not get bread for their table then “let them eat cake,” became a famous illustration of how royalty could become ignorant of the plight of the lower classes. This, together with the invention of the roller-milling system that replaced the more cumbersome and less efficient wind and water mills, meant that for the first time in history, whiter flour (and therefore bread) could be produced at a price that brought it within the reach of everyone. As we have noted, during periods of famine or other calamities during history, the governments of the time were quick to protect the people’s bread. During the first world war, experiments began to solve problems like keeping bread fresh for troops in the trenches, the conservation of supplies and the stoppage of waste. Substitutes for wheat, such as mixtures of peas, arrowroot, parsnips, beans, lentils, maize, rice, barley and oats were used in bread experiments. By 1917 food-ships were being sunk by submarines to such an extent that the nation was in dire peril of starvation. As well as using some of the substitutes mentioned the government fixed a maximum price for bread and issued rules for reducing waste. Bakers were forbidden to sell bread until it was twelve hours old, no stale bread could be exchanged, only ‘regulation’ flour could be used, the millers preparing flour from such grains as the authorities provided, and under their control. Even the shape of loaves was controlled, and all fancy pastries were forbidden. Another order was made in 1918, that bakers should use a proportion of up to 20% of potatoes in their bread. Later, during the Second World War, regulations were again imposed on the baking industry. The ‘standard’ loaf became a rather sad gray colour, not very appetising to look at, but not at all unpleasant to eat. The wide varieties of loaves on sale today in all their variety of shape, texture, and flavour and still at a comparative low price, the time when it was thought that ‘poor and common people should eat poor and common bread’ while only the rich should be able to enjoy the real white wheaten loaf. Even with the competition of a growing variety of foods, bread remains important to our daily diet and our psyche and retains a prominent place in the local marketplace. A healthy and nutritious food to fill the stomach as well as feeding the soul. This entry was posted in Breads, The Evolution Of . . . and tagged baking, bread, larder, oven, Quaker. Bookmark the permalink.